Surely I can make crackers better and cheaper than the ones at the store, right? Have you ever stood in front of a wall of crackers trying to figure out which ones will give you the most nutrition for the least amount of money and last more than a day in the presence of hungry children but that they will like enough to eat before they get stale? This is far too common for me. Watching the price of a box rise from 50¢ per ounce to well over $1.25/oz makes me want to do without them altogether. Really? $4 for a box of no-brand graham crackers? What is going wrong in the supply chain here? With the weather turning cooler and the house staying colder through the day, it’s the perfect time to bake something like crackers. They’re as easy as pie… crust. I decided to make three kinds today, and they are all delicious. The quick sticks are super dipped in hummus. The wheat squares are amazing with a little extra sharp cheddar cheese, and the flatbreads are just plain wonderful. Take your pick or try all three! 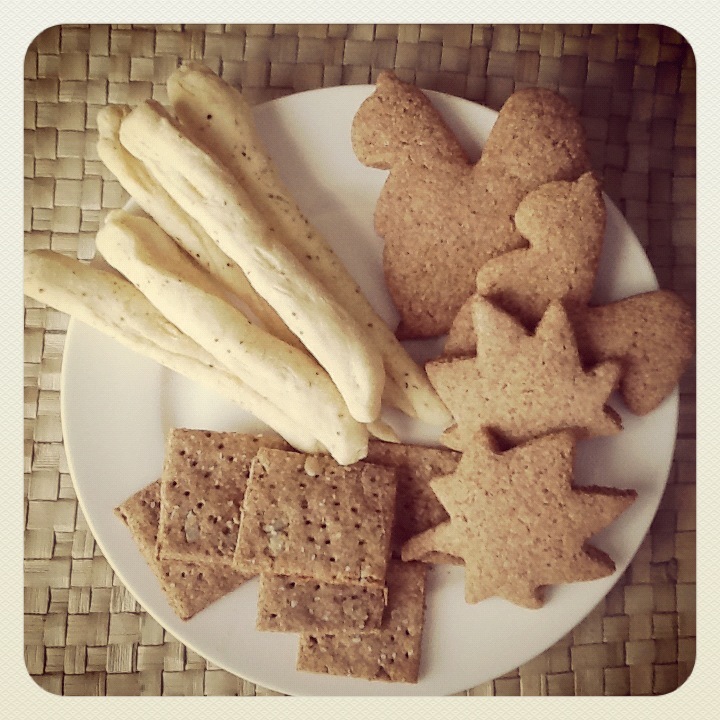 This entry was posted in Autumn, Recipes, Regarding Food and tagged Baking, crackers, fall, Regarding Food by Maren. Bookmark the permalink.